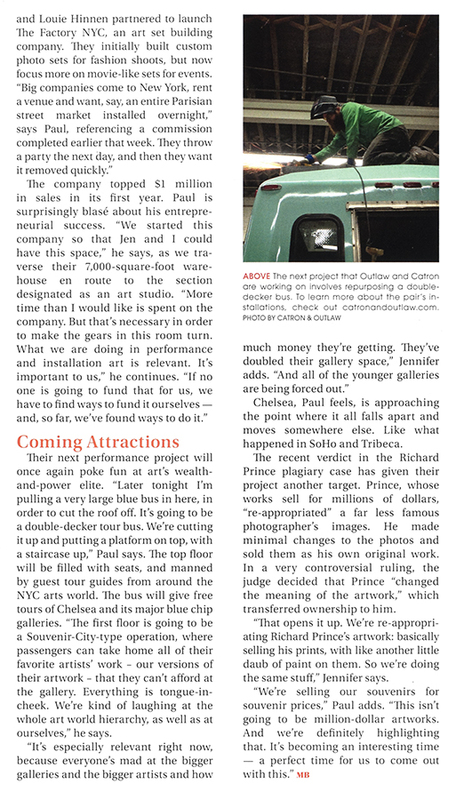 Mobile Alabama writer and photographer Adrian Hoff's Gallery article, Dynamic Duo, profiling Paul Outlaw and Jennifer Catron — Revitalizing Performance Art in the world’s art capital, New York City. Published in PMT Publishing's Mobile Bay Magazine, September 2014. 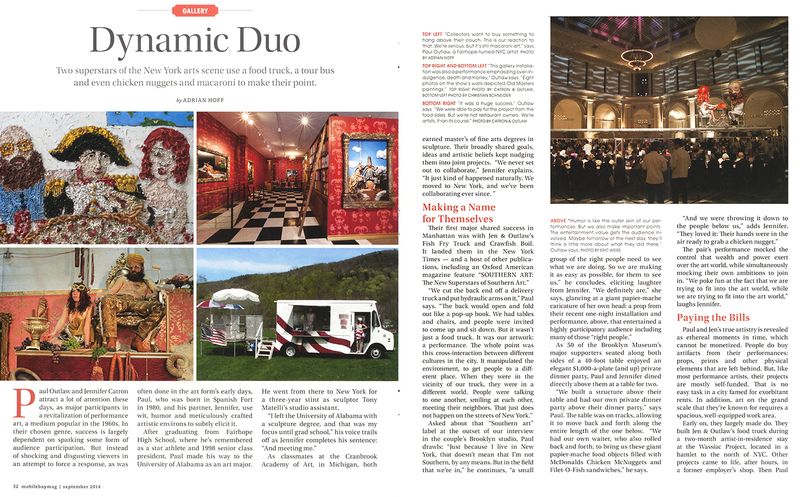 Two superstars of the New York arts scene use a food truck, a tour bus and even chicken nuggets and macaroni to make their point. by Adrian Hoff. Mobile Bay magazine, September 2014. Paul Outlaw and Jennifer Catron attract a lot of attention these days, as major participants in a revitalization of Performance Art — which erupted in the 1960s, catapulting a hand-full of its practitioners to international fame. Or infamy. But its initial incarnation was short-lived, and had largely faded from view by 1980, when Paul was born in Spanish Fort. The partners (domestic, as well as artistic) are quick to mention that their hybrid blend of performance, installation, and sculpture is undeserving of the genre’s lingering negative connotations. They share some of their predecessor’s anarchistic goals of tearing-down, and re-building, certain traditional aesthetic values. Theirs is art with an underlying message, often tinged with sharp social commentary. Success is largely dependent on sparking some form of audience participation. But instead of shocking and disgusting viewers in an attempt to force a response, as was often done in the ’60s, Paul and Jennifer use wit, humor and inviting, meticulously crafted artistic environs to subtly elicit it. After graduating from Fairhope high school, where he’s remembered as a star athlete and 1998 senior class president, Paul wended his way to the University of Alabama as an art major. He went directly from UA to New York, for a three-year stint as sculptor Tony Matelli’s studio assistant. “I left the University of Alabama with a sculpture degree and that was my primary focus: more tangible, abstract, things that exist— structures and actual physical sculptures. It didn’t change until going to grad school, and...” he says, voice trailing off as Jennifer completes his sentence: “meeting me,” she says laughing. Their first major shared success in New York was with Jen & Outlaw’s Fish Fry Truck and Crawfish Boil. It landed them in the New York Times — and a host of other publications, including Oxford American magazine’s SOUTHERN ART: The New Superstars of Southern Art. Asked about that “Southern Art” label at the outset of our interview in the couple’s spacious, but chronically cluttered Brooklyn studio, Paul drawls: “Just because I live in New York, that doesn’t mean that I’m not southern, by any means. But New York, a lot of people say it’s the center of the universe. And I believe that in a lot of ways, especially in the field that we’re in,” he continues, before explaining that the upper echelon of the art world is sparsely populated; that attaining the level of success they aspire to requires that “that small group of the right people” see what you are doing. “So we are making that as easy as possible, for them to see us,” he concludes, eliciting laughter from Jennifer. “We definitely are,” she says, glancing at a giant paper-mache caricature of her own head: a prop from their recent one-night installation/performance whose highly participatory audience included many of those self-same right people. As fifty of the Brooklyn Museum’s major supporters, seated along both sides of a 40-foot table, enjoyed an elegant $1,000-a-plate (and up) private dinner party, Paul and Jennifer dined directly above them at a private table for two. “We built a structure above their table, and had our own private dinner party above their private dinner party,” explains Paul, laughing. The table was on tracks, allowing it to move back and forth along the entire length of the one below. “We had our own waiter, who also rolled back and forth, to bring us these giant paper-mache food objects filled with like McDonalds chicken nuggets and filet of fish sandwiches,” he says. The pair’s performance mocked the control that wealth and power exerts over the art world, while simultaneously mocking their own ambitions to join in. “We poke fun at the fact that we are trying to fit into the art world, while we are trying to fit into the art world,” laughs Jennifer. Their next project will also poke fun at art’s wealth-and-power elite. “Later tonight I’m pulling a very large blue bus in here, in order to cut the roof off of it. It’s going to be a double-decker tour bus. We’re cutting it up and putting the platform on top, with a staircase up,” Paul says, of a bus they purchased early this year. The top floor will be filled with seats, and manned by guest tour guides from around the NYC arts world. They’ll give free tours of Chelsea and its major blue chip galleries. “The first floor is going to be a Souvenir City type operation where you can take home all of your favorite artists’ artwork, that you can’t afford at the gallery — our versions of their artwork. Everything is tongue-in-cheek. We’re kind of laughing at the whole art world hierarchy, as well as poke fun at ourselves,” he says. Chelsea, Paul feels, is approaching the point where it all falls apart, and moves somewhere else. Like happened in So-Ho, and Tribeca. The recent verdict in the Richard Prince plagiary case has given their project another target. Prince (whose works sell for millions of dollars) “re-appropriated” a far less famous photographer’s images. He made minimal changes to the photos and sold them as his own, original work. In a very controversial ruling, the judge decided that Prince “changed the meaning of the artwork,” which transferred ownership to him. “That opens it up. We’re re-appropriating Richard Prince’s artwork: basically just selling his prints, with like another little daub of paint on them. So we’re doing the same stuff,” says Jennifer. Their timing was equally adroit with their food truck, hitting the street just as the west coast concept was moving east. Paul and Jen’s true artistry is revealed as ethereal moments in time, which cannot be monetized. People do buy artifacts from their performances: props, prints and other physical elements that are left behind. But (like most performance artists) their projects are mostly self-funded. No easy task in a city famed for exorbitant rent-rates: work on the grand scale they’re known for requires a spacious, well-equipped work area.